Trails attain the park's peak in less than 0.4 miles from any approach. If you wind your way throughout the park on spiraling trails, you can create loops that approach one mile. The trails to the summit are each less than 0.4 miles, and vary in steepness and difficulty. The designated hiking trails on the north side of the park are steeper and rockier than the approach from other directions. Corona Heights Park is open year-round; many visitors say that the wildflowers in the spring are a highlight. The west side of the park has a fenced, off-leash dog area. Visible from many parts of the city, distinctive terra cotta-colored crags crown the summit of Corona Heights Park. The rocks offer a perfect perch to sit and overlook San Francisco. 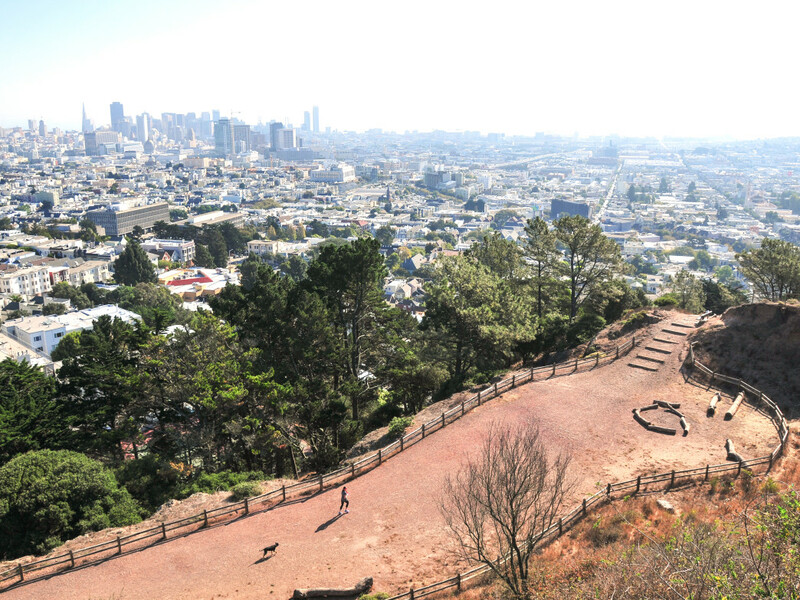 The short trails of varying difficulty, some of the city's best panoramic views, and an off-leash dog area, make Corona Heights ideal for urban hiking and exploring. The climb to the park's rocky crown will not take you more than a few minutes, yet provides some of the most dramatic and easily attainable scenery in the city. Located in the heart of San Francisco, an urban hike through Corona Heights Park promises standout views and scenic open space. Beginning from the surrounding neighborhood, trails climb almost 300 feet to the park's rocky and treeless peak. From the north, a narrow dirt trail ascends steeply over uneven ground through groves of eucalyptus, cypress, and oak. If you are looking for more stable footing, other approach trails are wider and stabilized by railroad ties, creating stairs. Approach via the hiking trail as it zigzags steeply up to the base of the rocks. Here, you can look closely at the distinctive reddish rock— radiolarian chert, formed in the ocean million of years ago and pitched onto land by subduction. Follow the trail around the outcropping and up onto the peak. Once a quarry, park's summit has several sheer drops that are fenced for safety. At the top, scramble up to your chosen perch and take in the stunning view. Twin Peaks dominates the landscape to the south, downtown San Francisco and the Bay sprawling to the east. 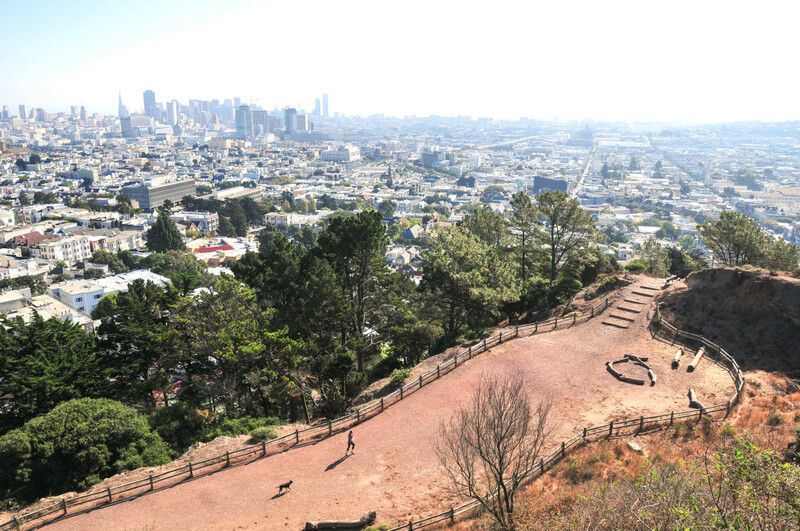 The trees of neighboring Buena Vista Park to the northwest add greenery to the panorama. Whether you stay a few moments or linger and take in the scenery, you will return to Corona Heights Park for the view. View lovers, urban hikers looking for a short trail, dog owners, and those looking for a epic place to picnic will love visiting Corona Heights Park. If you are looking for longer trails or the feeling of escaping from the city, you should consider visiting some of San Francisco's larger parks instead. Free parking available on 15th Street as well as Museum Way.